The sessions last month in Berkeley were fabulous. On February 22, about 16 of us gathered to engage in Method Mapping, under the able leadership of Sue Woehrlin. Method mapping means taking a type of group process you are familiar with, and figuring out how to illustrate it using the Group Works deck. For example, this time small groups worked on Sociocracy, World Cafe, Anti-Oppression, and more. We intend to enter the "maps" created this way into our online module, along with posting photos & videos about them. One of the groups also had an exploratory conversation to notice what we are learning about different ways of creating the maps. While the people who can participate most effectively have experience both with the Group Works deck and with the particular method under consideration, as long as they have one or the other it's enough to get by. Overall it was very fulfilling. The following day, almost two dozen people attended an introductory workshop on how to use the deck, led by Sassy & Tree. This Applications workshop arose out of a common experience we've been having since the deck was published, which is that when we show it to someone new, the first thing they say after, "Oh! How beautiful!" is: "What do you do with it?" This workshop is designed to answer that question. We offered a combination of sample activities to try out, stories from other people's experiences, and collective brainstorming on other possibilities. An open workshop on the Group Works deck and ways to use it to help your meetings and group events go deeper, be more lively, and accomplish their goals. To attend, please RSVP to Sassy at sassy@sassycooperates.org. A deck of 91 beautiful cards, available for $25 in print or download for free from www.groupworksdeck.org (also available for iPad and soon an iPhone app). Each card describes one pattern that shows up in meetings that have a sense of life in them. Card Mapping Program Has Arrived! To try out the new card-mapping program, first log in on the regular site (otherwise you won't be able to save any work in the new program), and then go to this page:Card Mapping. The program includes documentation and help pages, visit the links posted there. This new program is still in "beta," so for any work you care about, we suggest making notes in hard copy or on your own system, or laying out the physical cards and taking a picture for the record. A huge thank you to Vine, our dedicated programmer. Before there was a 91-card deck called Group Works, there was a profusion of full-scale methods for working with groups large and small: Way of Council; Open Space; Art of Hosting; World Cafe; Appreciative Inquiry; Future Search; Sociocracy; and dozens more. The deck aimed to distill the core wisdom underlying the successful application of these methods: what do they have in common when they are working, when a group really flows? Now it's time to do some "reverse engineering." We want to take the cards and use them as a common vocabulary to map out the methods. If you had to pick 3 or 5 or 10 cards to explain to someone how your favorite method works, which ones would you choose, and in what order? Good news: Tree & Sue's proposal for a workshop on the cards has been accepted for the upcoming NCDD conference in Seattle! If you are attending, come and share your experience with the cards... If you know someone from your network coming to the Seattle conference, encourage them to check out our workshop. Group Works Cards: Applications Friday, October 12, 2 -4 p.m. 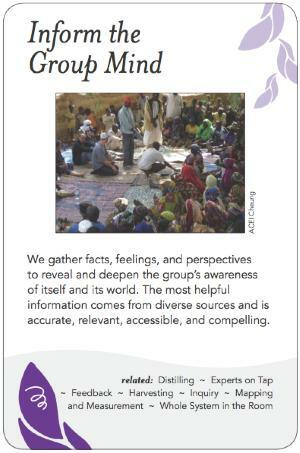 The Group Works deck is a creative synthesis of core wisdom in the field of facilitation and group convening, collaboratively distilled over several years by experienced practitioners from a variety of organizational backgrounds. Come to this workshop to learn how these pattern cards can be used by groups and individuals for reflection, planning, analysis, and other guidance to generate more alive and productive group sessions. Participants will receive a color booklet with summary charts, suggested uses and further resources. Sue & i have developed a workshop covering these that i am hoping we are able to deliver at the NCDD conference and elsewhere. The Oregon Mediation Association has accepted my proposal to present a concurrent session at their fall conference. The coordinator of the Alt Blues Recess coming up in a few weeks wants creative workshops there even though it's mainly a dance event. And the workshops coordinator at the Beloved Festival just asked me about presenting a workshop on Group Works. I'm excited that we are getting the word out in a variety of venues. On May 10th Tree Bressen and Sue Woehrlin co-hosted a telephone presentation on the card deck with some 45 NCDD members around the country. Tree and Sue shared the history of the Group Pattern Language Project (and specifically the process that birthed the cards), lead participants through a couple of reflective exercises with the category keystone cards from the deck, addressed possible uses of the cards, and then facilitated an open-ended discussion. Several other project members participated, including John Abbe, Raines Cohen, Betsy Morris and Amy Lenzo. Toward the end of the call Sandy Heierbacher (NCDD director) invited the assembled group to brainstorm sugestions for how the cards might be used at the upcoming national NCDD conference in Seattle this coming October. All in all, a very lively event! In recent weeks we've been mentioned in newsletters by both the World Cafe and AmericaSpeaks, in addition to Tom's blog entry on us at NCDD. After three years and countless hours of meetings and work, the Group Works card deck, the first product of the Group Pattern Language Project, is finally out! You can order copies of the deck here, and you can download a free PDF copy here. We're finishing up work on a mobile/phone app version of the deck as well: more info on that here. Heartfelt thanks to all who contributed!